Our Revolutionary War has a history of heros. Many, however, who fill the history books are not without controversy. Sybil Ludington (April 5, 1761 – February 26, 1839), daughter of Colonel Henry Ludington and his wife, Abigail Ludington, is one of those people. Sybil has been celebrated as a heroine of the American Revolutionary War since about 1900. At the age of 16, she rode her horse, Star, on a night ride on April 26, 1777, to alert militia forces in villages of Putnam County, New York and Danbury, Connecticut, to the approach of the British regular forces. A young American patriot, Sybil Ludington is the female counterpart to the more famous Paul Revere. The ride was similar to those performed by William Dawes and Revere (Massachusetts, April 1775). Although Ludington rode more than twice the distance of Revere and was much younger than the two more famous men. The story of Sybil primarily remained a local legend until her story was first published in 1880 by local historian Martha Lamb. Alexander Hamilton wrote Col. Ludington: “I congratulate you on the Danbury expedition. The stores destroyed have been purchased at a pretty high price to the enemy.” This points to the success of the battle, requiring a forewarning to accomplish. Sybil received personal thanks from both Gen. George Washington and Gen. Rochambeau, the French commander fighting with the Americans. This is some of the documentation used by Martha Lamb and others to establish the authenticity of Sybil Ludington, story. In 1777, Sybil Ludington was a typical 16 year old girl for the times. She was putting the younger children to bed on the night of April 26, 1777, when word reached her house that the British were burning the town of Danbury, Connecticut, which was only 25 miles away. The British had entered Danbury and found some American military stores, stolen some, destroyed others and drank the whiskey. Drunk, they began ransacking the town, burning and looting. Her father was a colonel in the local militia. His men were scattered over a wide area around the Ludington house in Fredericksburg, New York (now Ludington). Sybil convinced her father to let her ride and summon the men. On April 26, 1777, Sybil Ludington rode through the night in Putnam County, New York to warn approximately 400 militiamen under the control of her father that British troops were attacking Danbury, Connecticut, where the Continental Army had a supply depot. On her way to gather her father’s troops, she was able to also warn the people around Danbury. Sybil’s father, Colonel Henry Ludington, had fought in the French and Indian War. He volunteered to head the local militia during the American Revolution. 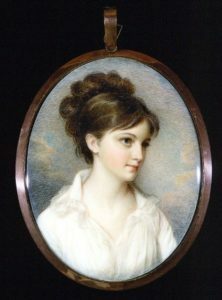 Due to her father’s position, Sybil had to move from town to town following her father, and unknowingly played an important role in the success of the colonies. The afternoon after Sybil warned residents of Danbury, the British troops burned down three buildings and destroyed multiple houses, but did not kill many people. 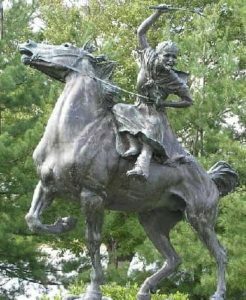 Unlike accounts about Paul Revere and William Dawes rides before the outbreak of the Revolution, little was told of Sybil Ludington’s ride for personal reasons; the only record of this event was written by her great grandson. Like many of the stories and details of the American Revolution, family history is critical to fully documenting the truth. Whether Sybil volunteered (as is often recounted) or was directed by her father to bear the order for muster and to rouse the countryside is a matter of uncertainty. (The classic account of the event, an article written in 1907 by Ludington’s great-nephew Connecticut historian Louis S. Patrick, says her father “bade her to take a horse, ride for the men, and tell them to be at his house by daybreak.”) Sybil’s ride has raised 400 men, and even fighting off a highway man with her father’s musket. The militia caught up with the retreating British and beat them back, too late to stop the attack, but not too late to make them pay dearly. Ludington’s ride started at 9 p.m. and ended around dawn. She rode a total of 40 miles in the hours of darkness. She rode through Carmel on to Mahopac, thence to Kent Cliffs, from there to Farmers Mills and back home. She used a stick to prod her horse and knock on doors. She had to defend herself against a highwayman with the stick. By the time she returned home, soaked with rain and exhausted, most of the 400 soldiers were ready to march. The American militia arrived too late to save Danbury. But, at the start of the Battle of Ridgefield, they were able to drive General William Tryon, then British governor of the colony of New York, and his men to Long Island Sound. Ludington was congratulated for her heroism by friends and neighbors and also by General George Washington. 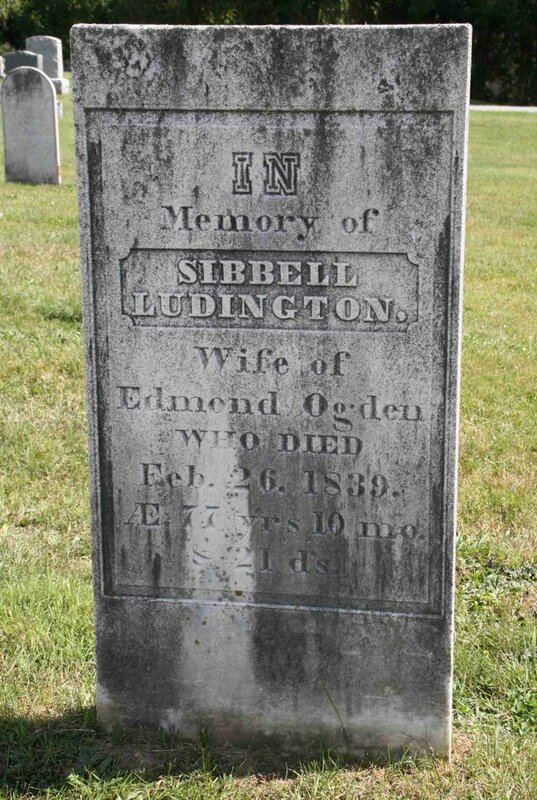 After the war, in 1784, when she was 23 years old, Sybil Ludington married Edmond Ogden. They had one child together, named Henry. Edmond was a farmer and innkeeper, according to various reports. In 1792, she settled with her husband and son in Catskill, where they lived until her death on February 26, 1839, at the age of 77. She was buried near her father in the Patterson Presbyterian Cemetery in Patterson, New York. Her tombstone, at right, shows a different spelling of her first name. There are several variations in the spelling of the name “Sybil”; all of which are correct. In 1935 New York State erected a number of historic markers along her route. A statue of Sybil, sculpted by Anna Hyatt Huntington, was erected near Carmel, New York, in 1961 to commemorate her ride. Smaller versions of the statue were erected on the grounds of the Daughters of the American Revolution Headquarters in Washington, D.C.; on the grounds of the public library, Danbury, Connecticut; and in the Elliot and Rosemary Offner museum at Brookgreen Gardens, Murrells Inlet, South Carolina. In 1975, Sybil Ludington was honored with a postage stamp in the “Contributors to the Cause” United States Bicentennial series. Each April since 1979, the Sybil Ludington 50k Run, a 50-kilometre (31 mi) ultramarathon footrace, has been held in Carmel, New York. The course of this hilly road race approximates Sybil’s historic ride, and finishes near her statue on the shore of Lake Gleneida, Carmel.